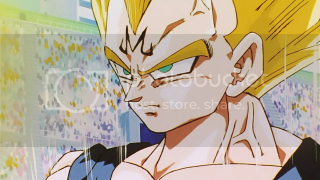 Synopsis: Gohan, now in the second full Super Saiyan stage, continues his fight with Dabura, but his struggling to finish it gets on Vegeta's nerves. Dabura spits on Gohan's glove, but the Saiyan discards it before his hand turns into stone. Dabura creates a sword and tries to cut Gohan, to no avail. Gohan destroys the blade. 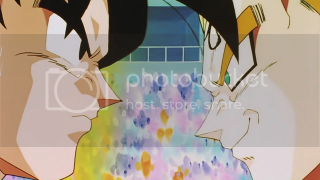 Vegeta becomes increasingly angry that the fight hasn't ended, wanting to get to his fight with Goku. Dabura senses something within Vegeta and informs Babidi, who sends them back to the ship. Dabura leaves the arena and returns to Babidi. He tells him that Vegeta has a great wickedness in his heart which Babidi can exploit to revive Majin Buu. 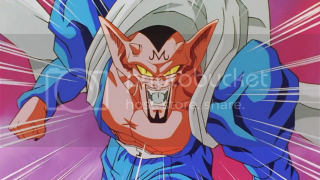 Babidi uses his magic to take control of Vegeta, transforming him into a more malevolent person by bringing out the evil in him, and at the same time, making him stronger. Babidi teleports the group to the Tenkaichi Budoukai, confusing the audience and Mr. Satan. A first it seems Vegeta is in Babidi's thrall, but he only accepts the extra power so he can fight Goku. However, Babidi is satisfied that the release of power will probably revive Majin Buu. 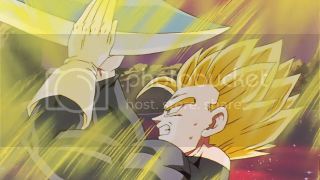 We finish up the less-than-inspiring fight between Gohan and Babidi about halfway into the episode and get to one of my favorite parts, the fight between Goku and Majin Vegeta. 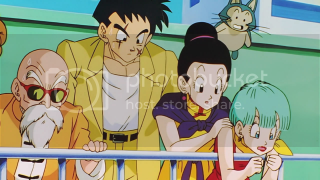 Fortunately, there's not a whole lot of padding in the fight, with the episode getting to the point about Gohan's lackluster fighting instincts and Dabura sensing Vegeta's rage without a lot of unnecessary back-and-forth between the characters. It makes sense that Dabura would try spitting on Gohan to turn him into stone, though I wonder why he didn't try it more than once, in rapid succession, at least to distract him so he could do something else. The bit where Gohan grabs Dabura's sword between his hands and breaks the blade is probably the only real highlight of the fight, however. 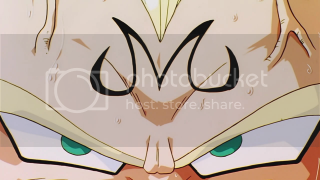 I noticed that the effect used for when Babidi uses his magic to take control of Vegeta is different than in the original. 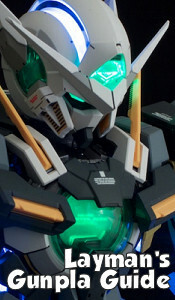 I guess they wanted to change it due to sensitivity to flashing light Japanese television is obsessed with more than a decade after the incident with that episode of Pokemon. Well, the new effect looks really cool, so I can't say I don't welcome it, even if it does seem a little out of place with the old animation. I do wonder about the ability Babidi has to transport the group to any place, because the gate to the lower level remains no matter where they're sent. Can everybody else see that thing? Does it mean that the ship is now underneath the ground of the Budoukai arena? Or is the gate there only? If the gate returns, is there an indentation where it used to be in the tournament arena? What about if Goku or Gohan just flies off into the distance, are they still technically in Babidi's ship? I don't really understand the physics of it, but I guess it's just magic and you're not supposed to think about it. Anyway, the next episode starts the long-awaited rematch! Goku vs Vegeta! Now there's something I actually hope they retained some padding for. I love that fight. Oh, and the music's really hitting its stride in sound in use, especially at the end of the episode, with things looking dire.